Has the appearance of your front teeth held you back in your social life and career? I hear from so many people who through no fault of their own have suffered immeasurably because of accidents, prescriptions, diseases and genetics. Here is a very thoughtful man's observation about the consequences of appearance and how our clip-on teeth helped him. "Perhaps now I can be appreciated for my brain power and not just my physical labor abilities. Isn't the world that way, though? No matter what you have in your brain if your appearance is less than appealing people will automatically judge you and discredit you before you get a chance to really open your mouth." So it seems that Imako's clip-on teeth could be a tool kept in any good psychologist's bag of tricks. 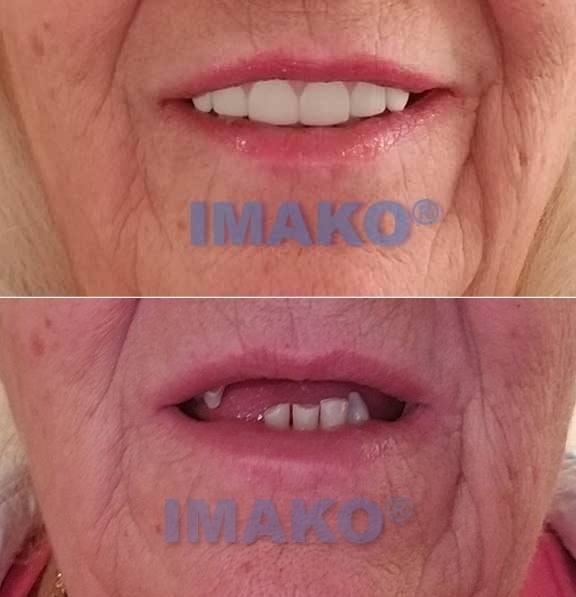 The Imako cosmetic teeth have the power to improve your social life if you are missing a tooth or two. "In November I purchased your cosmetic clip-on teeth. I am 85 years old and had two upper teeth screwed back by my dentist. One has never fell out but the other did several times. My dentist said to implant another tooth would cost a couple thousand dollars because he would have to remove and recrown two teeth as a bridge. He advised me that if I am okay with the tooth missing, I should just leave it. Soon after that I ran across your ad in a magazine and sent for a set of cosmetic fake teeth which arrived in November of 2016. Since I meet a lot of folks including at party events, I can say that these clip on upper teeth are Fantastic and a life saver even if once in a while I remove them to eat food I have to chew. "In fact, I am now considering buying another pair of temporary teeth in case I misplace these for a while. No one has ever commented that they look like false teeth. I try to convince folks I meet with teeth missing to definitely buy a pair." Smile with confidence using Imako's cosmetic clip-on teeth. Order yours today!